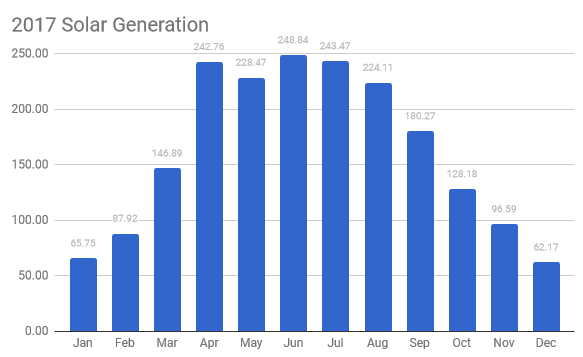 Another year with a drop in solar generation. Last year saw a slight decline that followed a couple of very good years including the record breaking 2014. This year however is the lowest so far with low figures throughout most of the year. The only highlight did see the last few months receive a little pick-up helped with a November record. Hopefully 2018 will be a better year for the Sanyo paneled 2kw system. The chart below shows the performance over the last twelve months. What can I Expect from Solar Generation?